A few weeks I reread ago two of the Harry Potter books (1 and 3). I just spent the past six hours with the dog on the couch reading The Pact: A Love Story by Jodi Picoult. I read The Other Boleyn Girl by Philippa Gregory over the weekend, mostly in another long marathon with the dog the second half of Sunday. We haven’t turned on the heat in the house and it gets down to 6o degrees inside after a cold night, which makes it quite nice to curl up with the little dog under a blanket for hours at a time. She especially enjoys the warmth. I’ve been leaving her sweater on when I head to work in the morning lately, and by the time I get home she has taken it off again. I’ve watched her do it before. Her technique begins with pulling one front leg at a time inside the armholes and out the neck, so that she’s wearing the sweater like a cummerbund around her middle. (Alternate acceptable spelling: cumberbund.) Then she presses against something to demobilize the sweater as she wriggles out the neckhole. If it’s cold she’ll leave it on, though, she seems to like it. She used to have two sweaters but a handmade one from my mom disappeared in the move, a nice black one with a pink stripe. December 24, 2008. Words. Leave a comment. I went to a busy Target this evening. The muscled, shaved-head man ahead of me in line was buying presents for what I imagined to be two daughters: a sparkly pink princess dress, a large floor-size board game, Duplos, a “Mamma Mia!” dvd, People magazine, art supplies… The cashier dutifully asked if he needed a gift receipt; he declined because his gifts were clearly selected based on his very specific children and their unique lives, preferences, and personalities. I admired what appeared to be a perfect assortment of gifts. I bought laundry detergent, non-Q-Tip-brand cotton swabs, large garbage bags, mouthwash, and four cans of Purina Alpo Prime Cuts in Gravy Beef dog food. She did not offer me a gift receipt. December 23, 2008. Words. Leave a comment. When I say diet, I mean it in the “the black bear’s diet is primarily vegetarian, consisting of berries, twigs, nuts, leaves, and roots” sense, and not “check out this new diet guaranteed to help me lose five pounds before February” way. Here’s the plan: eat at least 7 apples a week. Basically, an apple a day but with a little more flexibility. Why am I doing this? Because I like rules to follow, and it’s a New Year’s resolution that should be easy enough to keep, and apples are delicious natural packets of nutrients like fiber and antioxidants, and I’m constantly going through food fads (remember the 5-grapefruits-a-day craze of spring 2008?). And yes, also because eating an apple as a snack might help me maintain my current weight rather than slowly gaining through constant mindless candy and sweets consumption. I mean, if the totally reputable journal USA Today reports it then it must be true! I just bought some cameo apples, a type I’ve never tried before, and they’re part of the inspiration behind the new eating plan. They’re very sweet and crisp and juicy with a honeyed floral flavor to them, very unlike granny smith or fuji. A brief search just now has informed me that they came about by chance in an orchard in Washington in 1987 and are now one of the top 10 apples grown in the state. Cameo has the little R next to it so apparently is a registered name and there’s a Cameo Apple Marketing Association (CAMA). They’re right, though, it is the perfect eating apple. I’m going to slice myself up a second one right now. December 22, 2008. Words. 4 comments. The car is mine, all mine! A few days ago I received an envelope containing the vehicle title to my stunning 2002 Buick Century (“plenty of room for my grandkids and golf clubs”). My car loan is paid off! I also got a check for $75 because my last automatic payment overpaid the last bit of the balance. I might celebrate by washing my car, which I’ve never done in the three years I’ve owned it. December 20, 2008. Words. 1 comment. The Sharks were shut out by the Detroit Red Wings last night in a painful 6-0 game. People were looking forward to the game because it pitted the defending Stanley Cup champions against the NHL-record-setting Sharks (best record at 25 games, fastest to 50 points, best record after 30 games), and it could be an example of the Western Conference finals in the spring. It was a disappointment all around. After controlling play for the first ten minutes, San Jose couldn’t pull it together and watched goal after goal scored against them. Sure, it was their 3rd game in 4 days including back-to-back games and some cross-country travel, and they were understandably worn down, but still, it looked like they were an AHL group playing against an NHL team. I expect a much better match next time on January 17. The Sharks handily won the first game in October, and they’ll be eager to make up for last night. December 19, 2008. Words. 3 comments. 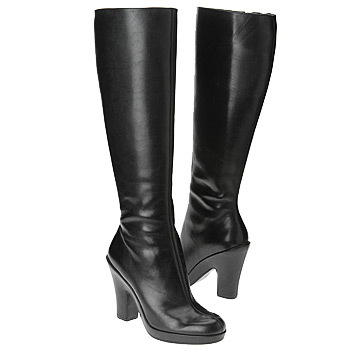 It is time to buy a new pair of knee-high black boots. I paid $30 for mine at Target and they have lasted me five years. Well, they’ve probably lasted maybe 3 years but I’ve been wearing them since then anyway. I know exactly what I want and I’m having trouble finding it: black, slightly shiny or satiny finish, high stacked heel, small platform, not a pointy toe, zip on the side or stretch to make it easy to put them on, vegan, fairly narrow calf. Everything I’ve found so far has a narrow thin heel, or it’s too flat and riding boot-like, or it has too many shenanigans with slouchy sides and tassels and 18 million buckles. Now I’m going to search for leather boots in the style I want, not because I would actually buy leather but just to see if the look I desire is even sold nowadays, or if it’s too “2003 called, they want their boots back”. December 11, 2008. Words. 3 comments. I’ve been with my new department for about a month now. This morning my old department was laid off as part of the big merger plans. I jumped ship just in time, it seems. In other office-related news I brought cookies to work today and made a few new friends. My oatmeal coconut cookies are fantastic; people are often surprised by just how good they are: “No thanks, I’m not a big fan of coconut… ok, I’ll try one just to be polite… oh my god this a really good cookie! It’s delicious!” I gave two people the recipe, took home an empty tupperware container, and lost another container to somebody who took it their desk to finish off the rest. December 10, 2008. Words. Leave a comment. My 29-gallon aquarium has been up and running for almost a month now and at least nine fish have died so far. I have hope that the chemical and biological balance is approaching equilibrium and the new litter of baby guppies will make it through. I chose Annabelle, one of the Original Three, at the pet store because she appeared to be pregnant and her apparent hardiness earned her a name. Her bag-mate was simply called “the other female who isn’t looking so hot” and died by the end of the first week. The five neon tetras were collectively named Seamus, and I accidentally poisoned them. One of the newcomers brought ich into the tank and it turns out that tetras are super-sensitive to ich medicine and should be given half-dosages, if that. The box did not specifically mention this issue as it pertains to tetras and I used the recommended dose. When I woke up in the morning, Seamus was dead, which is just as well for the baby guppies that would be born the next day. On Saturday somebody peered into the tank and said, “Hey look, Annabelle isn’t pregnant anymore!” I ran to the aquarium to check the typical baby guppy hang-outs and found the tiny fry huddled together — we counted at least 12! Good work Annabelle, may she rest in peace. (She died the next day, just like Charlotte at the fair.) They’ve more than doubled in size already and I counted at least 8 of them this afternoon. Before long I’ll be able to buy more neon tetras with less fear of Seamus eating the baby guppies. I really enjoy having an aquarium again, finally, and it will get even better when my fish stop dying all the time. December 9, 2008. Words. 1 comment.